I have found very little data for mystery lady number 2. She is mentioned in the obituaries of Carrie and Henry and found in 1920 and 1930 census in Allegany. There is nothing to suggest she ever married or what her birth name might be. It appears she used the name “Dr. Lee-o-netto” in legal documents, and perhaps legally had her name changed. I should look into name change records for the State of New York. I have one clue that suggests she purchased land in Olean in 1815. I have two census that show she did own property of substantial value in Allegany between 1920 and 1930. I know she was still alive in 1931, when Carrie died. I should check for land records between 1914 and 1920 and probate records after 1930 in Cattarugus County. Without a birth name, I have little chance of locating her birth record. 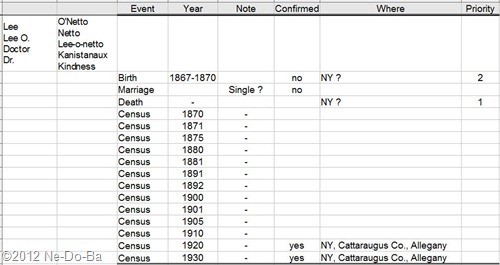 Both census show she was born in New York, which may be correct since her older siblings stated they came to the US about 1860 and Dr. Lee was born about 1869. Census records are split 50/50 between white and Indian. Either Marleah or the elder Leonetto could be her mother, but she is supposed to be a sibling to Henry and Carrie, so that should rule out the older Dr. Leonetto. Of course, she could be only a 1/2 sibling or a step sibling. Either Laton or Isaac could be her father. It is still very much a mystery as to exactly how she fits into the family and where she was prior to 1920. Did she receive her name as a gift when the elder Dr. Lee retired from active practice or passed away? Did she steal the name and insert herself into the Kanistanaux family without foundation? In future posts, I will address this lady as Lee-o-netto since this is the only name I have for her. I will refer to the elder woman as Leonette from here after in this blog.